(Over 12,000 reads so far – if you like it, link it! In its hayday, many moons ago, this piece was reaching the front page on a Google for “Dawkins” : Finnish translation here. Indonesian translation here and spin-off here. Hilarious spin-off radio interview (anonymous author!) here (YouTube) and here (audio only)). As I thumbed my way through the pages of “The God Delusion”, a question dropped into my head. Does Richard Dawkins really exist? Being a scientific and rational person, I decided that I wasn’t going to just accept any old theory on this question. If Richard Dawkins exists, then I would need to be shown the proper evidence for it. Others can have their own superstitious beliefs, based on who-knows-what, but I would only be convinced by empirical science. If there is a Dawkins, why hasn’t he shown himself to me? As I pondered this, a man wearing a pointy hat wandered into the room. He erected a little box a few feet off the ground, climbed on to it, and began speaking to me. As he talked he began, rather dogmatically, to insist on a number of things. Apparently, it was clear and obvious that Richard Dawkins existed. Did I not have his own book in my hands? Did it not have Dawkins’ name on the front, and the imprints of his thoughts on every page? If I wanted to see evidence for Dawkins, was it not to be found throughout this little tome? Dawkins, he said, had shown himself to me everywhere. What could be a sufficient cause for such a book, if not a Dawkins? The alternatives were incredible. They required far more faith than simply to accept that the pages were the work of the said Richard. As I pondered this idea, a man with a white coat suddenly appeared. He smiled warmly, showed me a piece of paper with a huge number of letters on it, and began to address me. As he did so, he drew my attention to a number of undeniable facts. The book that I was holding, you see, was made up of pages. And each of those pages could be shown to be composed from a certain type of paper, made from wood pulp. Upon the paper, were a number of very tiny dots, arranged in a kind of code. Everything about the book could be explained, and he had explained it. I was impressed by the man in the white coat, because he did not point to uncertain theories, or dubious inferences. What he was talking about was plainly fact. I could see with my own eyes just what he meant! The book had an obvious explanation, and needed no magical theories of Dawkins to be invoked on its behalf. Furthermore, theories of Dawkins’ existence had been responsible for a terrible amount of wrong-doing. All over the Internet there were to be found gaping non-sequitors, caricatures, allegations of child abuse and all kinds of evils – all being promoted in the name of said Dawkins! If Dawkins did exist, I reasoned, he’s got a lot to answer for. To this, the pointy-hatted man took exception. I was, he said, denying the obvious. If there was no Dawkins, then there would never have been a book. The book was his handiwork, and had all the hall-marks of Dawkins’ character, dispositions and ideas displayed on every page. If I wanted to see the evidence for Dawkins, it was staring me plain in the face. But by now I knew that old funny-hat was just talking pure superstition. I could see that the book was a simple re-arrangement of only 26 letters. To be sure, I didn’t understand the picture on the cover too well, but this doesn’t mean we should invoke any kind of Dawkins. To do so would just be a “Dawkins-of-the-gaps” – a Dawkins who would vanish once science had made further progress. Looking over to my shelf, and perusing the Internet, I was able to find that the book contained ideas and arguments that were hardly special or unique – they were but re-hashings of things said a thousand times in the past. As such, it was clear that the book had developed by a purely natural and unintelligent process. A little moving around of the a’s, e’s, i’s, o’s and u’s, – shift this paragraph and shift that paragraph. Replace this argument with that one, and you can get from the most primitive forms of argument up to any book with no problems, just given enough time. No, hat-man was clearly some kind of fundamentalist, irrationally wedded to the idea that there was a Dawkins. If people like him are allowed to have their arguments heard, then sound logic proves we will all be killed by bearded mad-men, and reason insists that the world will be turned into a Dawkins-ocracy. I began to wonder if the whole Dawkins idea wasn’t rather dangerous. At this juncture, another man suddenly arrived in the room – I do not know where from. He was wearing glasses, and frankly looked a bit of a nerd. And it was to the a’s, e’s, i’s, o’s and u’s that he drew my attention. He would prove, he said, that they were not the product of a random accident, for they were arranged in patterns. The little letters, taken together, spelt out complex codes, which were drawn together into sophisticated arguments. This, he said, was the clear mark of intelligence. It had not developed from a previous volume, for modifying letters from their inter-related arrangement turns a book into useless gibberish. Deliberate design was evident in the book, and simple science and reason proved it. What is more, some arguments which I had thought were quite redundant and evidence of missing intelligence, could be shown to have a real purpose. As the nerdy man was saying this, I could see that the man in the white coat was turning into some kind of shade of beetroot. The nerd, he said, was a man he had seen outside the room, wearing a pointy hat. As such, he had nothing more to say than the other fellow, and should simply be ignored. His white coat was obviously bogus, for nobody had ever been seen wearing both a white coat and a pointy hat. What was more, were I to ask him whose was the intelligence behind the code, I would most likely find that it was none other than the discredited Dawkins. Pointy Hat In A Tux! As I looked hard at the third man’s glasses, they did start to look a bit odd to me. And there was a clear cogency in white-coat’s argument. This talk of intelligence was obviously but a poor disguise of the “dawkinsdidit” thesis. If a Dawkins designed the book, then who designed the Dawkins? This only moves – not solves – the problem; it is no answer at all. For it was clear that nobody would be able to explain just who was responsible for the Dawkins. The nerd protested that he was merely using science to identify intelligence. His science, he said, was valid whether or not the author was Dawkins, and could not be denied using philosophy and sophistry. But such protests were an obvious violation of my own constitution, which clearly separates faith from reason. Moreover, as I pondered the book, I could see numerous violations of logic, arguments by mere assertion, and the like. If there was some kind of intelligence behind this book, then it was obviously a pretty poor one! And so, using my great powers of rational thinking, I concluded that there was no evidence of intelligence in it at all. No, Richard Dawkins does not exist. I have never seen him. Science has given a full and satisfying explanation of the book alleged to be his handiwork. It is but a collection of fortuitously ordered a’s, b’s and c’s, recombined from previous patterns. There is the alphabet, there is a book of nursery rhymes and there is “The God Delusion” – and one developed from the other, though some of the details of which is the most primitive remain to be sorted out. The links between them may still be missing, but Science will have that worked out at any moment. Anyone who doubts this fact is either lying, mad or stupid (or wicked, but I’d rather not think about that possibility). Having settled the case, I congratulated myself on my acute use of logic and reason. After lunch, I have another pressing question to tackle. (Scroll down further for contact links and postscript). Hyper-scepticism is a very easy weapon to wield – against whatever you like. However, its champions routinely wield it only against things they dislike, whilst taking others for granted… convenient, but hardly the way of actual “rational thought” or “science”. Hyper-sceptical arguments require little intellectual capacity to construct – and have little value for those whose aim is to seriously discuss rather than just mindlessly oppose. “Does God Believe In Atheists? (John Blanchard)” – A comprehensive and examination and rebuttal of atheist thought throughout history, this highly readable 655-page hardback won the Christian booksellers’ book of the year in 2001. “Has Science Got Rid of God? (John Blanchard)” – 160 page paperback. John Blanchard’s own website has much more of this kind of material – including the above on video. 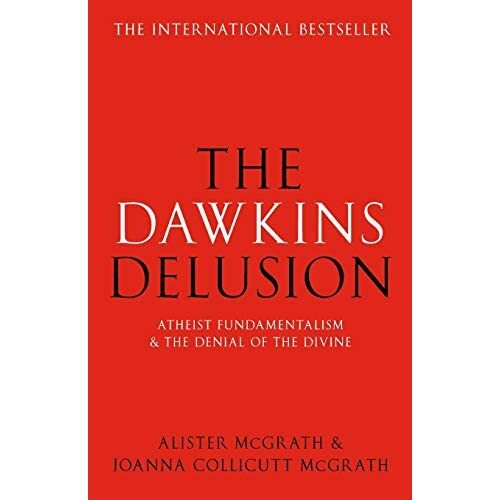 Just published – Professor Alister McGrath’s “The Dawkins Delusion” – analyses and dismantles the “logic” of “The God Delusion” – in a more serious-minded way than I have! Professor McGrath is a professor of theology with a DPhil in molecular biology from the University of Oxford. Copyright David Anderson 2006. Please contact me for re-publication rights. You are welcome to link to this web-page and advertise it widely. Before e-mailing me, if you wish to discuss the meaning of this parable, please make sure that you understand that a parable is not an allegory, and what the difference is. My e-mail address is dawkins-exists at dw-perspective dot org dot uk. “BCSE Revealed” – the research website I constructed exposing the bogus science education group “The British Centre for Science Education”. Arose from this blog. One Response to Does Richard Dawkins Exist?